Indow window inserts are made to fit in your existing windows where they are held in place with the company’s patented Compression Tube. It’s a truly simple way to upgrade your windows so they function like double-panes. In this short instructional video, you’ll discover how easy Indow inserts are to install and remove (and how invisible they are inside your window frames). Watch more videos. 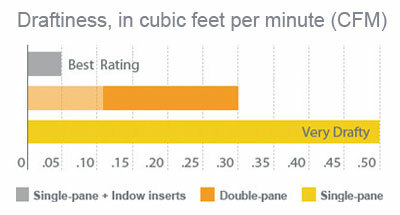 Double-pane window performance has never been easier. You’ll insulate your windows, increase your savings, and quiet your home all without damaging or removing your existing windows. A pilot study showed Portland-area homes saved almost 20% on their heating bills after installing Indow inserts. Learn More. Take a closer look to see just how much these inserts disappear once in place. Our customers are surprised by the elegant and almost invisible design of their Indow window inserts. See real-life examples.